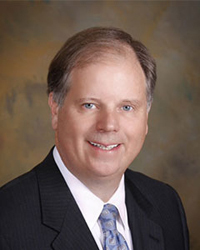 The University of Kentucky College of Law is pleased to welcome Doug Jones, former U.S. Attorney for the Northern District of Alabama, on the 51st anniversary of the 16th Street Baptist Church Bombing in Birmingham, Alabama. Jones is known for successfully prosecuting two of the four former Ku Klux Klansmen responsible for the 1963 bombing. Nine year old Jones was impacted by the bombing in his hometown which claimed the lives of four little girls and injured a fifth. Nearly forty years after the September 15, 1963 tragedy, Jones would prosecute Thomas Blanton and Bobby Frank Cherry. After the conviction of Blanton in 2001, Jones said, “They say that justice delayed is justice denied and folks, I don't believe that for a minute.” Cherry was later convicted in 2002. Jones will be speaking to the general public at Imani Baptist Church (1555 Georgetown Street) at 5:30 pm on Monday, September 15th. This event is free and open to the public. On Tuesday he will give various presentations during the day to students at the College of Law. In recognition of his work in the area of civil rights, the Birmingham Civil Rights Institute recently awarded Jones the 15th Anniversary Civil Rights Distinguished Service Award. He served as keynote speaker for the “We the People National Conference” in Washington, D.C. and is a regular presenter across the country at civil rights history workshops, law schools, Inns of Court and Continuing Legal Education seminars. He regularly provides legal commentary on local and national media programs such as 60 Minutes, Good Morning America, CNN Headline News and other television and radio programs. Now in private practice with the firm of Jones & Hawley, Jones represents individual, institutional and corporate clients in complex civil and criminal litigation. Since 2004, he has served as the court-appointed General Special Master in Tolbert, et al v. Monsanto and Pharmacia Corp., an environmental clean-up action involving PCB’s in the Anniston, Alabama area. This event is sponsored by the College of Law, the College of Law Trial Advocacy Board, the Martin Luther King Cultural Center, the UK Student Government, and the UK Black Lawyers Student Association.